When cleaning exterior surfaces around the home, there’s no longer any need to spend hours scrubbing away at them by hand. A good pressure washer can shave off a great deal of time and effort, whilst removing dirt and grime effortlessly. 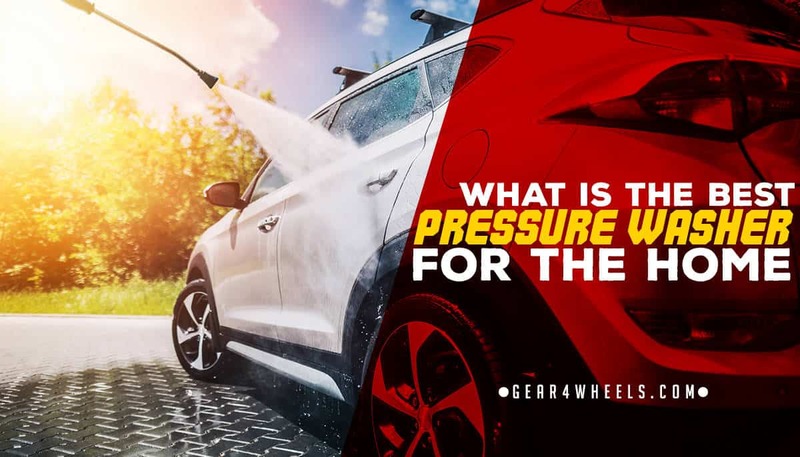 Below, we’ll look at the best pressure washers for using around the home. You can check out our full comparison of the top pressure washing machines of the year here. Running on AC power, the SPX3001 2,030 PSI Pressure Washer from Sun Joe puts out over 3,500 cleaning units. This washer falls into the mid-range tier and is suitable for cleaning a range of smaller vehicles, lawn paving and walkways, or exterior walls. This washer features an 1800-watt motor. Feature-wise, the machine also includes a Total Stop System (TSS) that shuts the pump off when the trigger is not engaged. For the safety conscious, the machine is also CSA-approved, with a full 2-year warranty on all components. When coiled up and placed in storage, this pressure washer has a small footprint, as the front-mounted reel fully retracts the hose inside. The same can be said about the nozzle attachments, which also have their own attachment underneath the washer handle. Not only do you get a generous amount of attachments included straight out of the box, but each of these nozzles is easy to attach to the tip of the hose with a snap on mechanism, too. Though the hose reel is great for storage, it won’t work should you choose to extend the hose, which limits the range of the machine. In terms of spraying power, this washer will also struggle to reach the upper exterior walls of large houses. The power cord storage could also be better with the inclusion of a second hook. Once wound around the upper cable hook, the rest of the cabling hangs free. Finally, the manufacturer’s choice to place the hose connector on the front of the unit can be a hindrance. If you're looking for a pressure washer with a small footprint, look no further than the budget range Sun Joe SPX4000. We’ve chosen this model for its inexpensive price tag and ability to be collapsed. Despite its small stature, this washer features a 14.5 motor that produces a powerful clean. A built-in setting allows you to switch between 1,450 and 2,030 PSI for more delicate tasks, whilst easy glide wheels make it simple to move the machine around during operation. Like many other Sun Joe pressure washing systems, the SPX4000 features the Total Stop System (TSS) that prevents the machine from turning on by itself when powered but not in-use; this is a problem that affects some other washers. The unit can also collapse into a smaller footprint to be more easily stored, whilst also featuring wheels on the base to aid you when moving the machine around during move involved tasks. The length of the hose on this washer can make it tricky to reach higher surfaces on a building’s exterior. What’s more, Sun Joe has prevented any third-party accessories, produced by other brands, from being compatible with this washer. Sun Joe accessories are produced to a high quality, but this does limit choice around nozzles. The plastic casing surrounding the motor also feels quite cheap. The SPX3000 is a budget to mid-range washer from trusted industry brand Sun Joe. We've chosen this washer because not only does it have the usual features, but includes several very convenient others. Sun Joe features packed in, but it also features a compact, easily maneuverable body, with support for multiple cleaning products. This pressure washer has Sun Joe's Total Stop System, as well as the usual 2-year warranty with CSA approval. Where this model adds even more value is in the inclusion of dual detergent tanks, allowing you to tackle two different cleaning jobs without the need to wash out the tank and replace the cleaning product in between tasks. As mentioned above, the addition of a second tank is a great selling point for a unit that doesn’t carry a premium price tag. This washer is also very easy to assemble straight out of the box, so you won’t spend hours putting it together. Like many other units of this price range, the washer features only a single hook for hanging your hosing once you’ve finished cleaning. This leaves the cord prone to swinging or unfurling, so a second hook would be useful. The hose connector is also prone to becoming loose and leaking. Karcher are one of the brand leaders in producing high-quality non-commercial pressure washers. The K1700 electric-powered washer is a budget range unit that is perfect for tackling smaller tasks around the home. Highlights on this pressure washer include a storage bin and detergent tank, a turbo nozzle for increased cleaning power, and a heavy-duty frame that keeps the internal components secure. This model also comes with a 3-years warranty on parts, and limited warranty on accessories. The Karcher K1700 is built from materials that are both lightweight and durable. This makes it simple to maneuver the washer around whilst cleaning larger surfaces, yet protects the components from inevitable bumps and scrapes. A large storage bin built into the body of the unit stores all cords and cables, as well as the hose itself, and there’s also a detergent tank for fighting tougher stains. Though it’s relatively inexpensive, it feels as though it should cost more than it does. When looking at how efficiently a pressure washer can clean a surface, we look at the CU (Cleaning Units) rating. This machine has quite a low rating, meaning that it takes longer than some of the other machines we’ve picked. The only other negative point relates to the detergent tank, which must be cleaned out if switching cleaning products. That said, this is not a major drawback. The HUMBEE handheld model is truly representative of the budget pressure washer tier. This model made our list for having such outstanding mobility, with a very different look and feel compared to other units. For such a small model, you might not expect much in the way of functionality. However, this washer has 2 safety features; a child safety lock and Total Stop System, both prevent accidental misfire. If your intention is simply to wash down the lawn furniture, or you have a small family car, then this handheld washer might be enough for you. It’s the most inexpensive of the bunch, making it perfect if you want to speed up your cleaning game, without breaking the bank. Owing to its size, there are some obvious shortcomings to point out. There’s no room for detergent tanks or water heaters, meaning cold water only, and the motor is weaker than larger models. This means a weaker output that won’t handle bigger jobs. ​Our pick of these top 5 pressure washers must be the Sun Joe SPX4000 2030 PSI. Though a lot of these machines share similarities, this model is collapsible and easy to store. These benefits are usually synonymous with weaker pressure washers, but this machine still puts out a powerful spray.